As early as 1679-80, Edmund Andreas, Colonial Governor of the Colony of New York, suggested to Sir George Carteret the advisability of constructing a lighthouse on Sandy Hook. It was not until 1761, when the project was revived by the merchant community of New York City that any action was taken. Their financial future endangered, having lost some £20,000 due to shipwrecks in the first few months of 1761, 43 New York City merchants revived the idea of erecting a lighthouse on the hook. A plan to raise money was presented to the Provincial Council of the Colony of New York and approved. The funds to purchase the land and construct the lighthouse came from the proceeds of two lotteries. By Virtue of an Act of the Colony of New York made and passed the 19th Day of May, 1761, for raising the Sum of 3000£ to be employed for and towards purchasing so much of Sandy-Hook as shall be necessary, and there on to erect a proper Light House. The said Lottery to consist of 10,000 Tickets, at Forty Shillings each, whereof 1684 are to be Fortunate, from which 15 per cent is to be deducted. The drawing to commerce on the 2nd Day of November next or sooner of sooner full, at the City Hall in New York, under the inspection of the Corporation and two Justices of the Peace, or other respectable Freeholders of every county, who are empowered to inspect every Transaction of said Lottery. Tickets are to be had at the Dwelling Houses, of Anthony Ten Eyck, Theodorus Van Wyck, Abraham Lott, jun. and Dirck Brinckerhoff, who are appointed Managers, and sworn faithfully to execute the trust reposed in them. Tickets in the above Lottery may be had of William Bradford at the London Coffee House in Philadelphia. The first lottery was authorized by the New York Provincial Congress on May 19, 1761, for an amount not to exceed £3000. A committee of New York merchants composed of Messrs. Cruser, Livingston, Lispendard, and Bayard were appointed to supervise the lottery. The lottery was drawn on September 21, 1761, and the winning numbers appeared in the October 5, 1761 edition of the New York Mercury. The £750 raised was insufficient to start construction of the lighthouse, but was used to buy four acres of land on the hook from Robert and Esik (Isick) Hartshorne. The £750 price was deemed an "unreasonable" sum for such sandy soil, but as no better site was to be had, the sale was consummated and the title transferred on May 10, 1762. On December 11, 1762, the Provincial Congress of New York authorized lotteries "'to raise 6,000 pounds to complete the "Lighthouse" already started on Sandy Hook and to defray the "Exigencies of Government" one half of the sum to be devoted to each.'" Lottery, for the Year 1763. Light-Houses erected on proper Places, for the Safety of Trade and Navigation, being by all Trading Nations, allowed to be of the greatest Utility; the Legislature of the Colony of New-York, from a Conviction of the Necessity of a proper Light-House on Sandy- Hook, for the better Security of the Trade and Navigation of this and the neighboring Colonies, being ready and willing to assist towards the Completion of the Light-House already begun there, did, in their Session in December 1762, pass a Law to raise, by Way of Lotteries, the Sum of Six Thousand Pounds. the One-half whereof to be applied towards finishing and completing the Light-House begun on Sandy-Hook; and the other Half towards defraying the Exigencies of Government. In order therefore to carry into Execution the good Intention of the Legislature, the following Scheme of a Lottery, for raising Three Thousand Pounds, is presented to the Public: And is hoped, that from the immediate Necessity of the one, and the Urgency of the other Purpose, the Lottery will meet with all due Encouragement. The lottery is to consist of 10,000 tickets, at Forty Schillings each, whereof 1684 are to be fortunate. Subject to Fifteen per Cent, Deduction, viz. The drawing to commence on the Tenth Day of May next, or as soon before that Time as the Lottery is full, at the City-Hall of New York, under the Inspection of the Members of the Corporation. Tickets are to be had at the Dwelling Houses of Abraham Lott, jun. and Christopher Smith, who are appointed Managers, have given Security, and sworn faithfully to execute the Trust reposed in them. And as soon as the Drawing is finished, and the Books settled, the Numbers of the Fortunate Tickets will be published in this Paper, and the Monies paid to the Possessors thereof. ...octagonal Figure, having eight equal Sides; the Diameter at the Base 29 Feet; and at the top of the Wall, 15 Feet. The lantern is 7 feet high; the Circumference 33 feet. The whole Construction of the lantern is Iron; the Top covered with Cooper. There are 48 Oil Blazes. The Building from the surface is Nine Stories. The whole from Bottom to Top is 103 Feet. The lighthouse was built of rubble, about 500 feet from the tip of the hook. Today, due to the northward expansion of the hook it now stands about 1 ½ miles from the point. The lamps installed in the crown were of copper encased in a lantern of ordinary glass. The keeper lived in a stone dwelling beside the tower. His "contract of service" allowed him the privilege of "keeping and pasturing two cows," but also warned him that he should not use the tower as a "public-house for selling strong liquors." In order that the lighthouse pay for its upkeep and current expenses a light-duty of three-pence per ton was imposed on shipping using the channel into New York Harbor. Operating costs of the lighthouse for the first two years of operation averaged £419 per year. The duty levied on tonnage averaged £451 per year, which would indicate that the lighthouse was a mostly profitable venture, and even more so when you consider the tonnage and lives that were saved from a watery grave. ...the lighthouse at Sandy Hook was struck by Lightning, and twenty panes of the Glass Lantern broke to Pieces; The Chimney and Peach belonging to the Kitchen, was broke down, and some People that were in the House received a little Hurt, but are since recovered. 'Tis said the Gust was attended with a heavy Shower of Hail. During the American Revolution the lighthouse became a point of contention between the antagonists. In early 1776 the British fleet was shortly expected to appear off New York City, prior to the invasion of that city. The New York Congress, on March 4, 1776 resolved to destroy the light so as not to aid the enemy. On March 6 instructions were issued to Major Malcolm to remove the lens and lamps in secret. A memorandum from Colonel George Taylor, dated Middleton, March 12, 1776, states, "'Received from Wm. Malcolm, eight copper lamps, two tackle falls and blocks, and three casks, and a part of a cask of oil, being articles brought from the light- house on Sandy Hook.'" A British landing party was dispatched to relight the tower using improvised lamps and reflectors. This effort was apparently successful, because on June 1, 1776, the Americans again tried to douse the light, this time using a pair of six-pounders (cannon) mounted on several small boats under the command of Captain John Conover. The Americans succeeded in damaging the tower somewhat before being driven off by an approaching armed vessel. The Revolutionary War over, the newly formed Federal Government was small enough that President Washington could take a personal interest in the affairs of individual lighthouses. One of Washington's first official duties was to write a letter to the keeper of the Sandy Hook lighthouse directing him to keep the light tended until Congress could provide funds for its upkeep. After the Revolution, the lighthouse again became the focal point between two antagonists, this time between the State of New York and the State of New Jersey. In 1787, New York passed a law which required all vessels from other states to report at the local customs house where they were registered and cleared, paying a fee for the privilege. New Jersey retaliated by levying a £30 monthly tax on the Sandy Hook lighthouse which was still owned by New York. The dispute was defused however, when the Federal Government accepted title to and jurisdiction over the lighthouses then in existence and provided that "the necessary support, maintenance and repairs of all lighthouses beacons, buoys, and public piers erected, placed or sunk before the passing of this act, at the entrance of, or within any bay, inlet, harbor or port of the United States, for rendering the navigation thereof easy and safe, shall be defrayed out of the treasury of the United States." Two [beacons], made of wood; one lamp each; no reflectors. These beacon-lights are too small and inadequate for their intentions; they leak at every joint. These beacons, situated at the entrance of the great American emporium of trade, should be well built, and brilliantly lighted; but their utility is nearly lost, in their bad construction and miserable lighting apparatus. The lights are not lighted at sun- setting, and kept burning until sun rising, in compliance with instructions. The Keeper uses his own discretion in this matter, generally lighting about dusk and extinguishing at daylight. The Keeper stated that the oil last year was bad; the winter oil was cut, in cold weather, with a knife. The Sandy Hook lights are nor trimmed during the night; in the Keeper's opinion they do not require it! 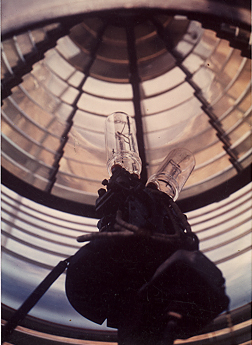 In addition to the main light, the Keeper also had two smaller beacons to maintain. These beacons, constructed in 1842, were located at 40° 27' 16" latitude by 74° 00' 27" longitude, and 40° 27' 48" latitude by 74° 00' 27" longitude. They were called the Sandy Hook East and the Sandy Hook West Beacons respectively. The Keeper of the main light was given a paltry amount of money to hire help, but was held responsible for all three lights. Only the main light stands today, the East and West beacons having long since been replaced by automatic skeleton towers, and their locations have been changed many times to fit the current disposition of the hook. The West Beacon was refitted in 1855, the East Beacon was rebuilt in 1856. The main light received a new lighting apparatus in 1856, a 3rd order Fresnel lens, made by P. Sautter & Co., of Paris, France. This lens is still in place. In 1857 the main light underwent extensive repairs, including a new edifice, a brick lining inside the tower, and iron steps which replaced the worn wooden ones. There is a "legend" about a secret cellar under the main light, which, when opened in 1857, revealed a skeleton sitting at a table in front of a crude fireplace. While intriguing, the fact is that there is no cellar under the lighthouse, but instead is under the keeper's house. Some variations of the legend say this, but also give the date as closer to 1883, when the keeper's house was torn down (there have been 3 documented keeper's houses). As to the skeleton, there has not been any documented proof which would confirm or deny the story. In 1867 the East Beacon became the first light in the United States to be equipped with a steam driven fog siren. The siren consisted of a fixed disk with slits radiating from its center. A second disk with the same arrangement of slits was revolved back of this, which high pressure steam was driven through both, and emitted from a horn at one end. The siren apparently lasted until 1883, a newspaper account of that year stating that a "new siren has been purchased and will soon be erected at the station in place of the one nearly worn out." The crib work at the West Beacon was replaced in 1874 at a cost of $6,000. The Keeper of the main light received a new home in 1883, the old dilapidated dwelling was razed and replaced by a "substantial double frame dwelling with ample accommodations for the principal and assistant Keepers." This is the dwelling that stands today. The Sandy Hook lighthouse became the first lighthouse in the country to be lit by electric incandescent lamps in 1889. Earlier, in 1886, the Lighthouse Board experimented with electric arc lamps placed in the torch of the Statue of Liberty, which was used briefly during this time as an aid to navigation. 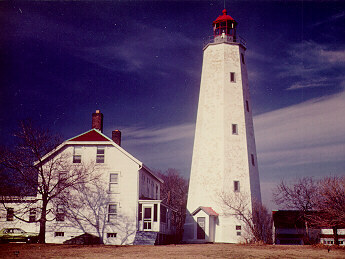 In 1964, the lighthouse celebrated its 200th Anniversary. It is the oldest original lighthouse in the country. At a ceremony celebrating this event, Walter I. Pozen, a New Jersey native and assistant to the Secretary of the Interior dedicated the lighthouse as a National Historic Landmark and presented a scroll and plaque to Captain J. H. Wagline, Chief of Staff of the Third Coast Guard District which maintains the light. The plaque was bolted to the base of the lighthouse. The lighthouse and surrounding Fort Hancock are part of Gateway National Recreation Area today. The lighthouse is still in active operation and is equipped with a 3rd order Fresnel lens illuminated by a 1000 watt bulb, and emitting 45,000 candle-power. It is visible 19 miles at sea. Samuel P. Jewell Keeper 1885-1923? Richard R. Terhune Boatswains Mate 1950-??? ?